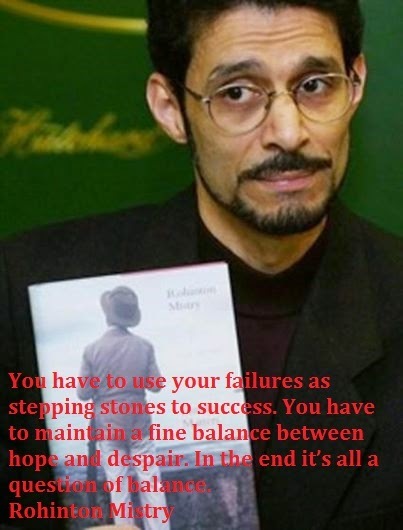 Rohinton Mistry is an Indian born Canadian writer, known for his works like Such a Long Journey, A Fine Balanace, Family Matters and Tales from Firozsha Baag. Here I have compiled down some of the best Rohinton Mistry quotes for you. After all, our lives are but a sequence of accidents - a clanking chain of chance events. A string of choices, casual or deliberate, which add up to that one big calamity we call life. But it was an unrefrigerated world. And everything ended badly. But nobody ever forgot anything, not really, though sometimes they pretended, when it suited them. Memories were permanent. Sorrowful ones remained sad even with the passing of time, yet happy ones could never be recreated - not with the same joy. Remembering bred its own peculiar sorrow. It seemed so unfair: that time should render both sadness and happiness into a source of pain. Depression is a red herring. I think a lot about the past, it's true. But at my age, the past is more present than the here and now. and there is not much percentage in the future. Distance was a dangerous thing, she knew. Distance changed people. Everyone underestimates their own life. Funny thing is, in the end, all our stories...they're the same. In fact, no matter where you go in the world, there is only one important story: of youth, loss and yearning for redemption. So we tell the same story, over and over. Only the details are different. Flirting with madness was one thing; when madness started flirting back, it was time to call the whole thing off. He who spits paan at the ceiling only blinds himself. If there was an abundance of misery in the world, there was also sufficient joy, yes - as long as one knew where to look for it. Lately you are brooding too much about rights. Give up this dangerous habit. The human face has limited space. If you fill it with laughter there will be no room for crying. The whole quilt is much more important than any single square. There didn't seem to her any harm in it, and the make-believe was so comforting. ...you have to use your failures as stepping stones to success. You have to maintain a fine balance between hope and despair. In the end it’s all a question of balance. What an unreliable thing is time--when I want it to fly, the hours stick to me like glue. And what a changeable thing, too. Time is the twine to tie our lives into parcels of years and months. Or a rubber band stretched to suit our fancy. Time can be the pretty ribbon in a little girl's hair. Or the lines in your face, stealing your youthful colour and your hair. .... But in the end, time is a noose around the neck, strangling slowly.